On 28 October, Az2b Theatre performed their powerful and emotive dementia awareness play Grandma Remember Me to over 400 students at LSBU. The play, which has been performed twice in the Houses of Parliament, was performed in front of students from the School of Health and Social Care as part of the School's drive to improve dementia awareness in health care and become a dementia-friendly organisation. 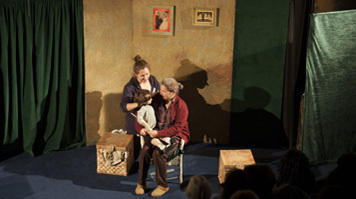 The play highlights the importance of relationships and memories for both carers and individuals with dementia, tackling a sensitive issue in a thought-provoking storyline based on a young girl's experience of her grandmother's dementia. The performances, arranged by Professor Lesley Baillie, Florence Nightingale Foundation Chair, were well received by the students with extremely positive feedback from those in attendance. Audience member and postgraduate student Ellie Warwick said: "I am really impressed with the content and by how moving it was. I previously worked in a care home as a Health Care Assistant, and it makes you realise that not enough people know about the skills you need when caring for people with dementia." The School of Health and Social Care aims to support the national strategy for dementia-friendly communities in addition to effectively preparing our students to care for people living with dementia as required by Health Education England. Starting this year, the School has delivered Dementia Friends sessions to all new Health and Social Care students as part of their University induction. The sessions introduce the five key messages about dementia and students are given the opportunity to become a Dementia Friend where they commit to dementia-friendly action. During September, over 1000 students who enrolled on nursing, social work, occupational therapy, radiography, operating department practice and midwifery courses committed to being Dementia Friends. The School believes that ensuring all new students learn these five key messages about dementia during their induction is a positive star and will be built on as they learn more about dementia during their courses. LSBU's work on improving dementia awareness also involves the evaluation of Barbara's Story. This is an ongoing collaborative project with Guys' and St Thomas' NHS Foundation Trust (GSTT) where a film was created to raise awareness of dementia for GSTT staff, with an additional six films developed. Lesley presented Barbara's Story and its evaluation at the first global conference on 'Empathy' which was held in Prague on 7-9 November. The research team are currently evaluating the impact of Barbara's Story on the staff at GSTT. In working towards creating a dementia-friendly community, our Dementia Champions are now planning to offer Dementia Friends sessions more widely across the University for both staff and students.